The reason why we are much concerned about the jewelry this season is that unlike the winter season, summer give you a chance to flaunt your favorite accessories. If you have an eye for fashion, you must know that this season is all about colorful yet delicate designs; whether you are spending your money on a pair of pretty earrings, a ring or a necklace to pair up with your summer outfits. Having a lot of colors and designs around, and a lot more options to choose from, it often gets hard for the fashionistas to spend on the right product. Therefore, we have made the search easier by suggesting to you a few of the most beautiful jewelry designs that you should get your hands on, this summer. We would be glad if you could have a look and let us know how helpful this list was, for you. Yellow is the new black, isn't it? People having good taste in fashion know how much yellow is trending this season. From shirts to pants to shoes to belts and even your jewelry, you will be seeing a lot of yellow this season. This yellow-orange Sapphire and Diamond cocktail ring is a must-have this summer. The bright, eye-catching color and the classy cut make it a necessary addition to your closet. The half-moon shaped diamonds on both the sides accentuate the beauty of the sapphire center making it a very attractive item. These pear-shaped emerald and diamond halo earrings can be your favorite product this season. The delicate design, the beautiful pear shape and of course, the beautiful emerald stone – is there any single thing to not like about this pair? These 3.37 carats earrings are a perfect addition to your jewelry box this season and trust us, you will never regret spending your money on this as the gorgeous, sophisticated design will never go out of fashion. You must be aware of the floral designs trending in fashion. In fact, not just this summer; floral designs have a strong connection with springs and summers, so they have not really been out of fashion on hot days. If you are looking for your summer jewelry, you should consider this floral blue sapphire and diamond ring. 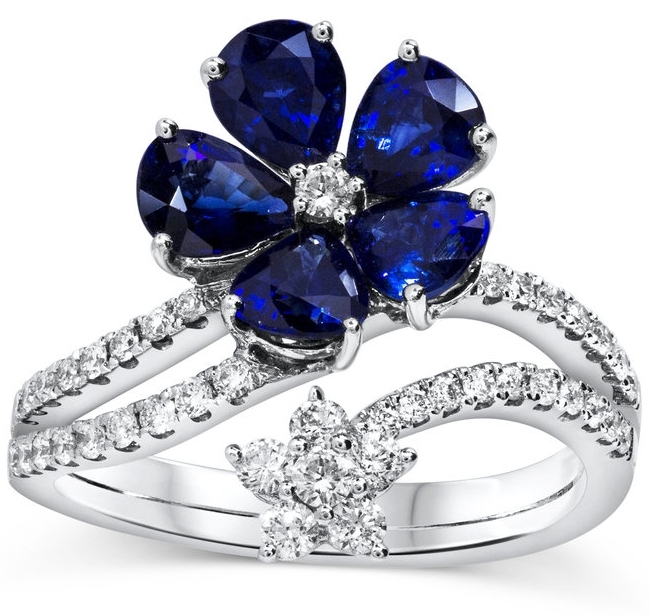 Features a big, blue sapphire flower at the top and a little, gorgeous diamond flower at the bottom. We would definitely suggest you get this one as you can wear it at any time. Yellow is indeed in season. 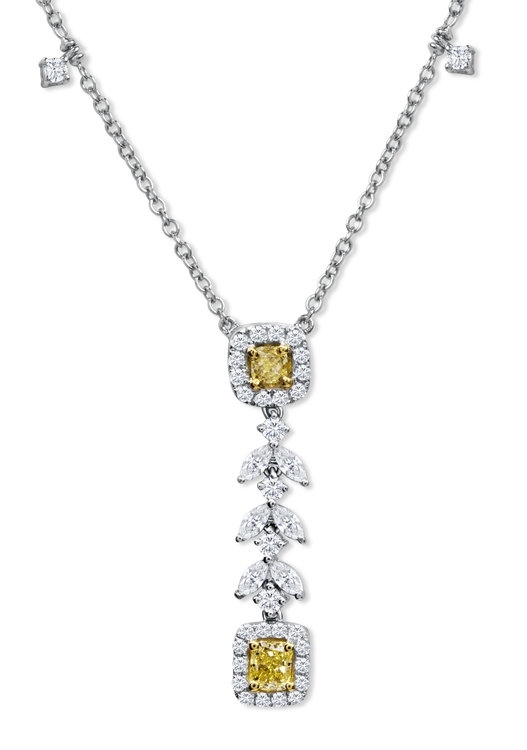 The extremely beautiful color combination of yellow and white diamond in this necklace make this halo drop necklace a very good choice to spend your money on. Summer is all about sleeveless, open and loose dresses that not only make you feel comfortable but also allow you to show your body off. And since sleeveless dresses have never been out of fashion, you need some arm jewelry to pair up with your favorite outfits. 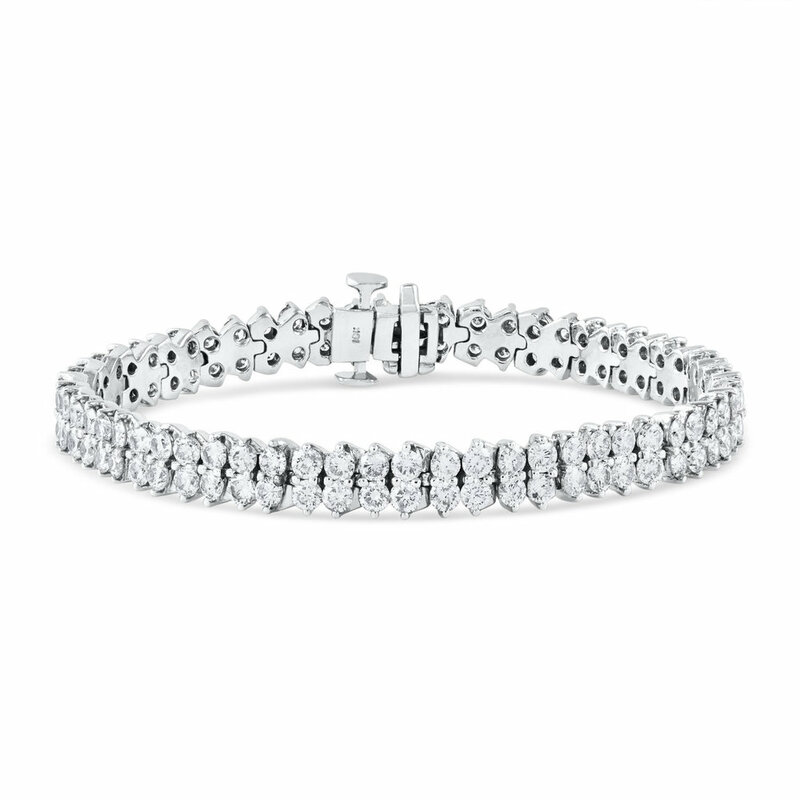 This double line tennis bracelet is a slightly upgraded version of the classic tennis bracelet and can undoubtedly be, your best friend throughout the season. From formal to casual outfits, you can carry this one for a perfectly stylish and classy look. The elegant design and the combination of white gold and diamond speak for themselves. So fashionistas, you do know the rule about black, right? If it's black, don't think twice and grab it before someone else gets it. Whether it's clothing, footwear or accessory, you can never have enough black. This super trendy and elegant black diamond tennis bracelet can be a perfect choice to pair up with your summer dresses. Although it's a very simple design, the usage of black diamonds and white gold in it makes it a masterpiece. And of course, we all know how versatile black color is. It can literally go well with all the colors out there. Planning to get your hands on this one? You better hurry up. Whether you are wearing an off-shoulder dress or are going for full sleeves, there is no restriction in pairing this necklace up with any kind of dress. The two rows of beautifully cut diamonds accenting the green emerald in the center make a stunning design. The thin, white gold chain also gives a beautiful, minimal yet classy look to it. You can wear this necklace with casual, formal or semi-formal wear and it will complement each outfit. The colors that will go best with this gorgeous necklace are red, green, yellow, black and white. When it comes to summer fashion, there are some basic things that you know are just absolute classics. Bright colors and floral designs are two of the things that give you the perfect summer feels. This pendant has both, the bright red color of the beautiful ruby gemstone and the nicely crafted floral design make it a perfect fit for the summer. The nicely shaped round diamond in the center is covered by the beautiful ruby stones at the edges in a floral design. You can carry it with a variety of outfits that you like. Also, you can get earrings in the same design to pair up with the necklace and make a complete set. Although we are mentioning it at the end, but trust us, this one is our favorite pick from this list. 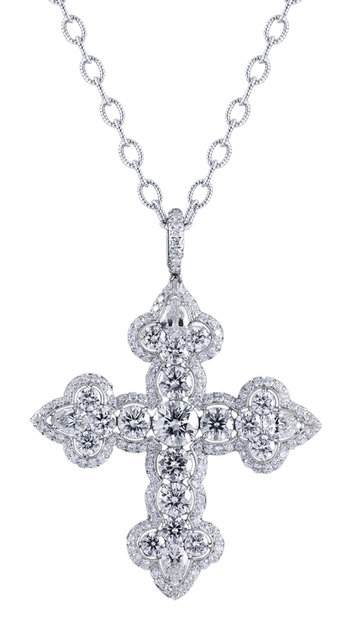 The reason why we prefer it is that it is very versatile, not just because of the diamonds, but the design too. Diamond jewelry is usually used for formal or semi-formal wear, for an elegant, sophisticated look but this one can also be used to compliment your street style, urban, chic look. 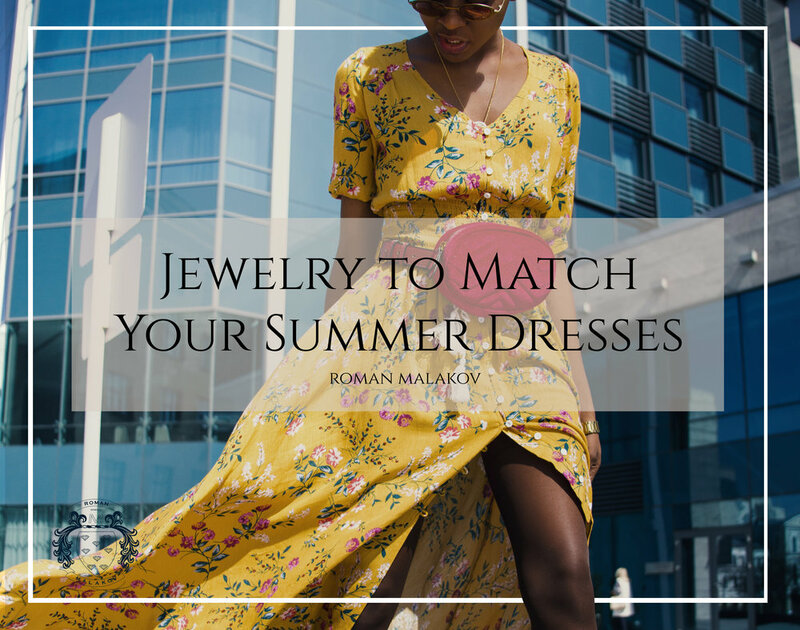 While there are a lot of options for the perfect jewelry to match your summer outfits, there are a few things that you need to keep in mind, have a look. 1. Try to wear lightweight jewelry, that does not irritate your skin in the burning heat. 2. It is not necessary to wear jewelry of the same color as your outfit. 3. Mix and match different colors together for a trendy look. 4. Spend your money on jewelry that is versatile and can be carried with several summer outfits that you own.